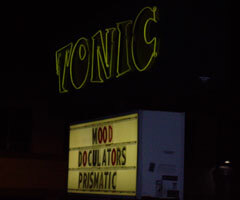 Our first gig at the Tonic Lounge was an easygoing night on the town. We opened for "Prismatic", a groovy group from Eugene, OR, who complimented their sound with live didgeridoo textures as well as a very trippy onstage artist. Our set saw some solid transition jams, a rocking "Big Water", and an overall good flow.